In 2008, Chef Tony Maws’ life changed in two significant directions. First, in November he moved his lovely and intimate Craigie Street Bistro into a much larger space in Central Square where it became “Craigie on Main.” But before that, in June, he became a first time father to son, Charlie. After having a phenomenal Father’s Day meal at Craigie on Main, Chef Maws kindly took the time to answer a few questions about being a new father. In that brief conversation it became clear that the passion that he shows for food has quickly extended to his son, but that his son is also taking in his parents’ love of good eating. Chef Maws pointed out that he has always been very conscious about what he eats and that he cares deeply about the philosophy and politics of food. To extend that understanding to his son means to not only teach him to cook, but to share the process of watching food from farm to table. So, while I am proud that my 3 year old can help to make bagels, Chef Maws can’t wait to teach his son to fish, and to break down a pig (!). Chef Maws also highlighted that pasta can be one of the best items to cook with children as you can “mess around with it” and it can still turn out well. This year Charlie loved to pick strawberries at Drumlin Farm, but next year Chef Maws is looking forward to transforming those fruits into jams and jellies. 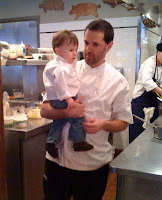 I reminded Chef Maws that Chef Ana Sortun has brought her 3 year old to Craigie on Main. I then asked (somewhat ambivalently!) if he had any plans to transform Craigie into a “family-friendly restaurant.” Luckily for those of us that treasure the more mature style of cooking and the atmosphere at Craigie, Tony said he didn’t have any plans to do so. In part, he noted, because people often seek out Craigie for a romantic dinner, and to have a certain experience. But he also emphasized that brunch at Craigie is intentionally a more relaxed atmosphere that is conducive to bringing children. Other favorite places that Chef Maws highlighted were Sportello in the Fort Point Channel, Highland Kitchen in Somerville and the Blue Room in Cambridge. For a more personal and very funny take on Charlie's eating adventure in Chinatown, you can read Chef Maws’ blog post here. To talk to Chef Maws is to talk to a man who is already so proud of his son, of his wife and of being a father. I wonder, will Charlie Maws be the up and coming chef we all should watch for in about 20 years?